Villa Paneretta protagonist of Today show on NBC networks. Villa della Paneretta filmed in NBC tv show "Today show"
At the top of a hill surrounded by 309 hectares of vineyards, olive groves and woods stands the Villa della Paneretta. It was built around an ancient watchtower in the aftermath of the battle of Montaperti in 1260. Then it was owned by the Carriers and passing from one noble family to another (including the Capponi and Gli Strozzi) became more and more a place of art culture and patronage, in the loggia you can appreciate frescoes by Poccetti, who before becoming Mannerist teacher, he decorated many Florentine facades including the wonderful Palazzo di Bianca Cappello. Also the wine production has historical origins and is attested by documents dating back to 1596. But back to your holiday home, entering the white driveway you will immediately appreciate a large lawn and the Castle, on the opposite side then to the left of the driveway the production of wine and just 20m meters later: the entrance to the garden appurtenance Villa, where you can enjoy the summer evenings in total relaxation or why not, let you organize a dinner by our trusted chef. The interiors of the Villa restored with careful attention to detail, boast 5 large bedrooms and 5 bathrooms for a total of 10 beds that can become 11 if necessary considering an additional room generally used as a TV. In this case, the bathroom is shared with a double so we recommend it for a child. In case you need a room with 2 single beds, ask and you will be given . • Air conditioning and utilities in general. - € 1.50 per person per night. Tourist tax. - € 20 per day for heating, when necessary. On request we can open the outbuilding of the villa (without AC), consisting of 1 double, 1 single, 1 bathroom with shower, living room and kitchen. 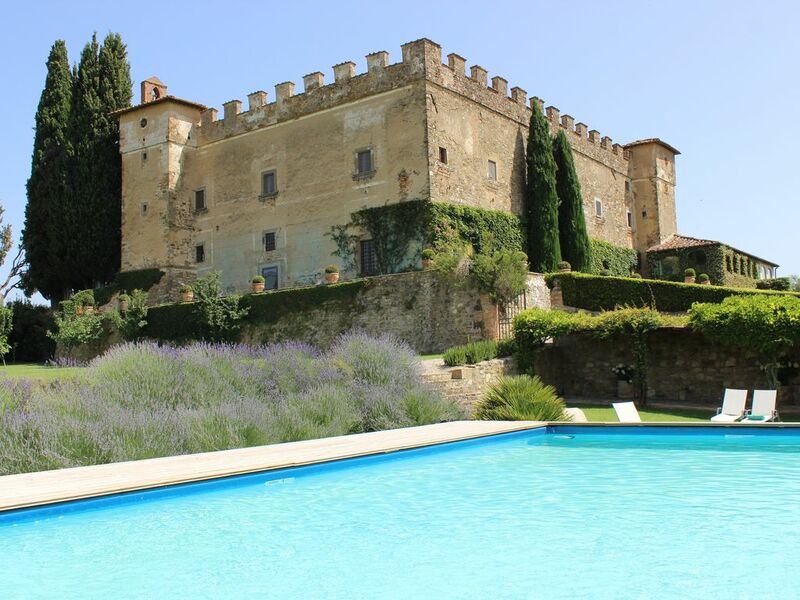 Thus reaching a maximum capacity of 14 people who can enjoy the garden of the villa and the pool on the opposite side of the Castle, as well as requesting the tasting of our wines and the visit to the ancient cellars. Today Il Castello produces 900 hectoliters of Chianti Classico and Igt of 22 hectares of vineyards. In short, if you are lovers of the countryside and in particular of Chianti, we are waiting for you . You can check in between 4pm and 7pm. We only ask you to advise us in advance to set the time. With just two couples, we didn't fill even half of the bedrooms here. The place is huge and comfortable. Bathrooms are all large, modern and clean. There are several living/sitting areas and nice areas to sit outside. The castle grounds are amazing and it's out in the country and very quiet at night. They arranged a chef for us one ngiht and we had a grand meal at home paired with some of our favorite wines from our trip. We highly recommend this place and you could house an army here. your review is so funny :) also in Italian we have a similar idiomatic expression, we say: "ci sta un'armata". Ah ah ah. We are glad that you enjoyed your stay and also of the outdoor spaces. Hope you can come soon in the future, here or in one of our villas. A beautiful property with a well kept and beautiful villa. Minor deficiencies were attended to immediately upon request. The Chef’s dinner our last evening was delicious. A special recognition goes to the property gardener who changed our flat tire for us. Absolutely stunning service. Grazie! Grazie! Please come back whenever you like. This lovely property is managed by lovely people. As others have mentioned you only see the castle if you book a tour, but this means that the house you are in is completely private. Our group of 8 had plenty of room. An enchanting place for well behaved children to stay! Air conditioning in all but one of the bedrooms, but even in August the room was cool enough without it. WiFi works. Pool was small but serviceable, with a great view and bordered on one side by fragrant lavender - very relaxing! Tour and tasting was excellent. We would have been happy staying put, but this was an excellent base for exploring the area. All in all we were charmed, we hope to return, and we highly recommend! And you know?! :) You gave me another point of view regarding the Castle and the fact that just who do the wine tour can visit the Castle, therefor the Villa have a good privacy!!! That's true! Thank you! Please come back whenever you like also in one of the Villas of Livitalian. Really outstanding all the way around. Two families (total of 10 people) stayed here in late June. We had a meal prepared one night, and did a castle tour / wine tasting. Very cool! Thanks. Amazing!! Fairy tale come true!!! There were 9 of us who stayed in the villa, which is beautifully decorated, well equipped and clean. Waking up every morning to head out for the day, you see the castle, and it is just absolutely surreal! Ending each evening with a glass of wine on the lawn in front of the well-lit castle to one side and the sunset to the other, is absolutely amazing!! The pool area has 2 covered areas for shade, which worked out very well for us. The staff is very accommodating! They helped us contact airlines for our lost luggage. They provided information for a personal chef and pastor to come for a special anniversary celebration. They even allowed us to use the old stone church on property for a vow renewal. We met the owner and her son, both lovely people. They do run a tight ship, as this is a working winery and olive oil production facility and the owner actually lives inside the castle. Do not expect to come here and have the run of the castle. The pool does have a curfew of 7/8:00 in the evening. To be honest, we were so exhausted from our day trips that it did not even matter. If you stay here, you are a guest, and you must be respectful of the property and owner. The wine tasting was fabulous! This stay was an absolute dream come true!! Please come back whenever you like, we are happy to have you with us. We produce wine and we are located in the Chianti wine region at just 7 km from the 1st town, so you'll have all the main services at just 10/14 minutes driving. There is also a real hospital in town. If you like Horse riding there is a club near home (the Paretaio).